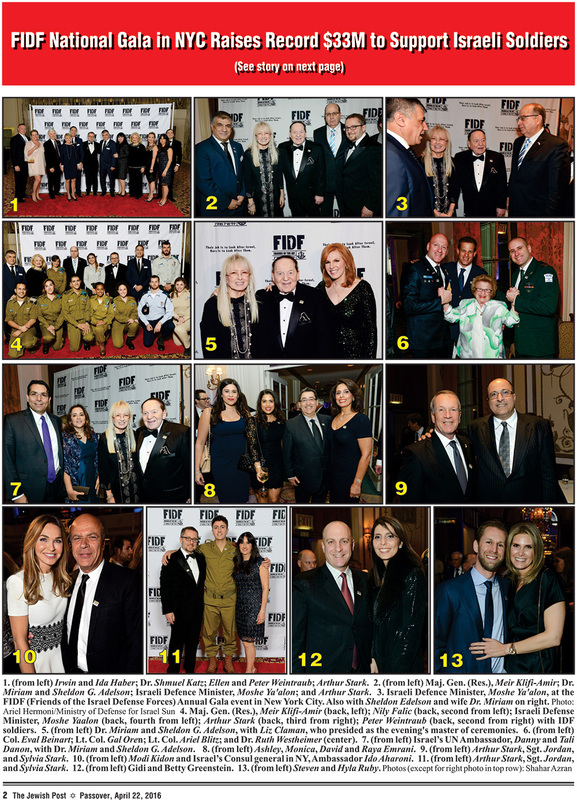 An overview of FIDF National NY Gala at the landmark Waldorf Astoria New York. NEW YORK � More than ���1,300 prominent business and philanthropic leaders from across the country came together on Tuesday for the Friends of the Israel Defense Forces (FIDF) National New York Gala Dinner at the landmark Waldorf Astoria New York. 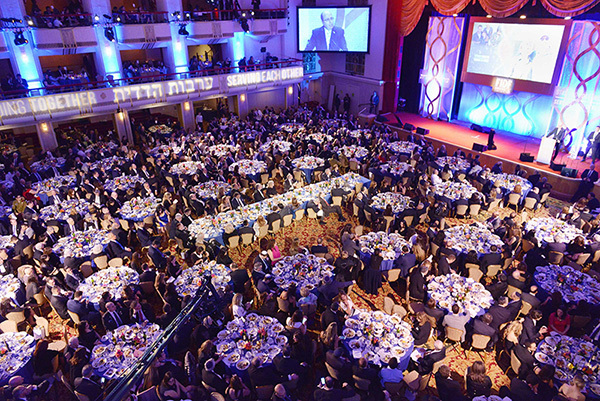 The gala raised a record-breaking $33.1 million to support educational and well-being programs for the brave soldiers of the Israel Defense Forces (IDF), featured a keynote address by Israel's minister of defense and former vice prime minister, Moshe Yaalon, and honored business magnates, philanthropists and steadfast supporters of Israel, Dr. Miriam and Sheldon G. Adelson. A 37-year veteran of the IDF, Yaalon, known as �Bogie,� began his service in the Paratroopers Brigade and became a commander in Israel's most elite special operations unit, Sayeret Matkal. Yaalon rose through the ranks, holding high-level command positions including chief of Israel's military intelligence, head officer in charge of Israel's Central Command, and chief of the general staff of the IDF. �We spoke about just how strong the ties are between our two countries and how much we value this special relationship. This unique bond between FIDF and its American supporters, the Israel Defense Forces, and the people of Israel is exemplified here tonight. Israel has no greater friend than the United States of America,� he said. The 2016 FIDF National New York Gala Dinner honored Dr. Miriam and Sheldon G. Adelson with the inaugural FIDF �Defenders of Israel� award for their lifelong philanthropy and support for a variety of causes in the U.S. and Israel. Israeli-born Dr. Miriam Adelson is an accomplished medical doctor and a former IDF soldier who served with distinction. Mr. Adelson is an entrepreneur and integrated-resorts developer who is widely acknowledged as one of the greatest business leaders of his generation and currently employs more than 50,000 people worldwide. They are partners in varied and global business and philanthropic activities. The Adelsons have joined a unique pantheon of the foremost names in Jewish philanthropy in modern Jewish history. They are the single largest funders of Birthright and Yad Vashem and have consecrated their success to the noble aim of always fighting for and protecting Israel and the Jewish people. FIDF's flagship national event was chaired by FIDF National President Rabbi Peter Weintraub. A Reform rabbi and businessman, he has been an avid FIDF supporter for 15 years and has sponsored academic scholarships for more than 70 IDF combat veterans through FIDF's IMPACT! Scholarship Program. Special guests included 30 IDF soldiers from various military units, including Sergeants Sydney and Solomon and Staff Sgt. Ariel, who are all originally from N.Y. and enlisted in the IDF as Lone Soldiers � those who serve without immediate family in Israel; a former commando from Israel's most elite special operations unit who received an FIDF IMPACT! scholarship and studies medicine in Israel; Israel Border Police Sgt. A, a Lone Soldier from France who recently saved fellow soldiers from a stabbing attack at her checkpoint; and Lt. Col. Shai Siman Tov, who was told he would never walk again when a terror tunnel collapsed on him during Operation Protective Edge in Gaza. Among the honored guests were Israel's ambassador to the U.N., Danny Danon, and Consul General of Israel in New York Ido Aharoni. Distinguished guests included Fox Business Network anchorLiz Claman, who presided as the evening's master of ceremonies; FIDF National Chairman Arthur Stark; FIDF National President Rabbi Peter Weintraub; FIDF National Chairmen Emeritus Nily Falic, Larry J. Hochberg, andMarvin Josephson; FIDF National Director and CEO Maj. Gen. (Res.) Meir Klifi-Amir; and FIDF Tri-State Executive Director Galit Brichta. Notable among the donations was a $10 million gift pledged by Dr. Miriam and Sheldon G. Adelson. Or Lachayal pledged $2.8 million and FIDF Young Leadership New York pledged $1.6 million. MASA Israel Journey, Genesis Philanthropy Group, and Nefesh B'Nefesh each pledged $1 million, as did FIDF National Chairman Emeritus Nily Falic. In addition, the Iranian American Jewish Federation pledged $610,000 and Beit Morasha pledged $500,000. FIDF was established in 1981 by a group of Holocaust survivors as a 501(C)(3) not-for-profit organization with the mission of providing and supporting educational, social, cultural, and recreational programs and facilities for the heroic men and women of the IDF. Today, FIDF has more than 150,000 loyal supporters, and 15 regional offices throughout the U.S. and Panama. FIDF proudly offers its support to IDF soldiers, families of fallen soldiers, and wounded veterans through a variety of unique and innovative programs. These opportunities reinforce the vital bond between the communities in the United States, the soldiers of the IDF, and the State of Israel. For more information, please visit:www.fidf.org.